The refugee experience in Australia is not a new one. In the forties, the first large influx of refugees came from war-torn Europe. In the 70's they came from South-East Asia, again from countries ravaged by war. For these people, often affected by trauma, settling in meant learning a new language and new ways of living in a climate and culture very different to their own. Their welcome was not always friendly, but over time, most settled in to a community accepting and appreciative of the contributions the newcomers would make. Today, the people seeking refuge here hail from all corners of the globe, driven from their homes by war, persecution, terror, poverty and natural disasters. Some arrive through "official" channels and are part of our annual humanitarian intake. Others arrive by boat or by plane and claim asylum when they arrive. Many of these people will face resentment and suspicion upon arrival making the job of settling in so much more difficult. Many too will live for extended periods in a kind of limbo, waiting to have their status determined. All have a legal right to claim asylum under international agreements to which Australia is a signatory, but the process is becoming increasingly convoluted and difficult. The level of government support offered to refugees and asylum seekers varies greatly. Some who arrive under humanitarian visas are given access to temporary accommodation and access to services such as English lessons. Others, struggling to prove their right to be here receive nothing and have great difficulty supporting themselves and their families. It costs nothing and takes no time but a friendly smile and a kind word in a chance encounter can make a difference to anyone's day especially someone with few local connections who may be feeling overwhelmed by everything that is new and different. Offer to help a newly arrived neighbour, colleague or parent at school as they become familiar with a new way of life. Navigating the transport, banking or school system can be quite overwhelming for people used to a very different way of living. By taking the time to understand the difficulties they face and pointing them in the right direction we can do much to smooth their path. Some resources that will help are SBS Radio's settlement guides and the Australian Government's Beginning a Life in Australia guide. The guides are available in many community languages. You might also direct newcomers in your community to the many free and low cost services offered by local agencies. And the local library can often be a wonderful source of information and support with some offering English classes and opportunities for social interaction. One of the many obstacles facing new arrivals is a lack of family support or access to childcare. Parents, women in particular, are often isolated, unable to attend English classes because they have no-one to look after their children. Many of the community organisations offering English classes will run playgroups or childcare sessions at the same time but they rely on volunteers to be able to provide this service. The needs of newly arrived refugees and asylum seekers vary greatly but after English lessons, the most common needs are access to legal and employment services, and computer skills. If you have experience in these areas you might consider donating your time and efforts in a practical way that can make a real difference,. 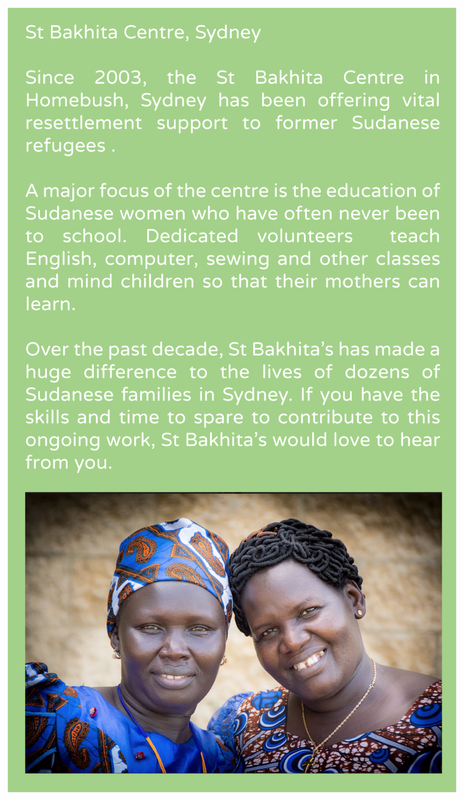 The Refugee Council has a list of organisations that may be seeking volunteers in different fields. Probono Australia and GoVolunteer may also have volunteering opportunities. Setting up house can be prohibitively expensive and many agencies rely on the kindness of strangers to assist their clients in this area. Good quality furniture, furnishings and homewares are always required and many agencies have food banks to meet the most immediate needs. It is always best to find out exactly what is needed and where. The Refugee Council's guide can direct you to the many agencies who provide services in this area. Support businesses employing asylum seekers and refugees. A number of social enterprises have sprung up in the big cities offering employment and much needed skill development to people who might otherwise have trouble finding work. Cafes such as Parliament on King in Sydney and Longstreet Coffee in Melbourne offer great food while providing social and economic empowerment to people seeking asylum. ASRC Catering, also in Melbourne is a ‘global food experience with a cause’, serving food that reflects the rich and diverse cultures of the cooks, supported by an experienced team of mentor chefs. The Asylum Seekers Resource Centre also offers a cleaning service. All staff are trained and have completed all police check requirements. Learn more about the plight of refugees and people seeking asylum and their experience in Australia. Advocate on behalf of asylum seekers.